INTEROIL says more than 1900 meters in depth has been drilled with the side track appraisal well at Antelope-7. This was carried out by Total E and P PNG (Total) as the operator of Petroleum Retention License 15 (PRL15) in Gulf. 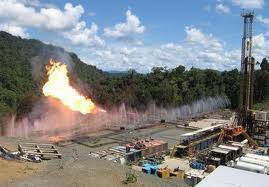 “On January 31, 2017, according to information provided by Total, the Antelope-7 side track appraisal well reached 1,980 meters measure depth below rotary table (MDRT) and is drilling ahead in the Orubadi Formation” Interoil said in a statement. The New York listed company said the side appraisal was due to difficulties that arose from initial drilling in the Orubadi Formation late last year. “On December 22, 2016, InterOil announced that the initial Antelope-7 well had reached 2,127 meters measured depth below rotary table,” Interoil said. InterOil holds a 36.5375 per cent interest in the well. Total has a 40.1275 per cent interest, Oil Search has 22.8350 per cent, and the remaining 0.5000 per cent is held by minority parties. Total is the world’s fourth-largest oil and gas company and a world-leading solar energy operator through SunPower. With operations in more than 130 countries, it has nearly 100,000 employees who are fully committed to better energy. That is what guides the company. We are also a world-class natural gas operator and a global leader in solar energy through our affiliate SunPower. The company’s activities span oil and gas production, refining, petrochemicals and marketing where it operates.